Maharashtra M.Tech Counselling 2017(महाराष्ट्र एम.टेक काउंसलिंग) is going to be conducted in the month of July 2017 by Directorate of Technical Education (DTE), Maharashtra. In the process of Maharashtra M.Tech admission, candidates who meet the eligibility criteria, including nationality and educational requirements, will be considered for admission. Through Maharashtra M.Tech Counselling Procedure 2017, candidates will be offered admission into the various colleges of Maharashtra state affiliated to Directorate of Technical Education committee. Maharashtra M.Tech Counselling Schedule will be conducted by DTE through a Centralized Admission Process (CAP) and is based on valid GATE scores. The counselling session includes a number of steps like registration, choice filling, fee payment etc. To get more precise details go through the information below provided. 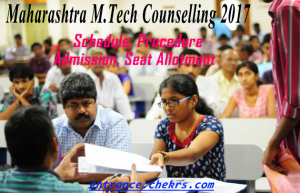 Eligible candidates who possess a valid GATE score can go for the process of Maharashtra M.Tech Counselling which is going to be conducted in July 2017. The candidates must fulfill certain Maharashtra M.tech Counselling Eligibility Criteria to apply for the admission process. Applicant must possess a Bachelor’s degree in the relevant field of Engineering from an All India Council For Technical Education or Central or State Government approved institution or its equivalent with minimum 50% marks (45% in case of candidates belonging to Backward class categories and PH candidates). Must possess a valid GATE score. Candidates must first register themselves on the official website by entering their name, address, and a password. Upon successful registration, applicants will receive a unique id through which they can log in to access the Maharashtra M.tech Application Form. thus candidates must fill the required details and make payment of application fee. Through this portal candidates can select the choice of their course and institute as per their preference. Candidates will be alloted their seat as per their preference and rank in the merit list. Candidates must bring the below-mentioned documents along with a set of photocopy for the verification purpose. All the aspirants will be provided their seat on the basis of GATE 2017 merit and choices submitted by the candidates. This will the provisional allotment, which will be confirmed when candidates will choose the Freeze option and report at the institute at the end of the counselling process. At the end of the counselling, applicants must report to the allocated institute on the scheduled date and time and confirm their admission process and fulfill all the admission formalities. Get the latest alert on Maharashtra M.tech Counselling 2017, by visiting our portal on regular basis. Here you can also get the information about Upcoming engineering exam calendar.